Nation correspondent Oswald Garrison Villard takes an acerbic look at Democrats more interested in ending prohibition than tackling the human suffering of the Great Depression. Let no man say that the Democratic Party’s Presidential convention, which has now adjourned, has been held in Chicago. I have just come from its last session; I have listened to all of the proceedings, the incredible speeches, including Mr. Roosevelt’s address after his excellent publicity flight from Albany–a stunt worthy of his famous cousin, Theodore. Still I insist that this convention has not been held in Chicago. It has been held in some No Man’s Land, in some utterly detached place, floating perhaps between heaven–or some other place – and earth. All presidential conventions are always wonderlands in their amazing exhibition of childishness and political immaturity, their intriguing, their humbuggery. But this one almost baffles description in its total detachment from the realities of life. Hour after hour we sat there in the sweltering heat–in one case thirteen hours of all-night misery–watching the speakers go through their motions, deafened and racked by the loudest organ on earth, the blaring bands, and the yelling–all the horrors and there was practically nothing whatever to give the listeners the faintest idea that this convention had any connection whatever with the United States of 1932. It could not have been much nearer than the moon to what is actually going on under the Stars and Stripes, and was certainly utterly remote from all the vital happenings of this workaday world. Yes, I know that in its preamble the platform speaks of “this time of unprecedented economic and social distress” and declares that those in charge of our government “have ruined our foreign trade, destroyed the values of our commodities and products, crippled our banking system, robbed millions of our people of their life savings and thrown millions more out of work, produced widespread poverty, and brought the government to a state of financial distress unprecedented in time of peace,” but even this carries no conviction that the convention was really concerned with or realized what is going on in the United States today. In this city in which it was supposedly held there is endless suffering and human misery, with hundreds of thousands of persons being supported by one dole or another. On the second day of the convention, the county treasurer announced that he would go before a county judge on July 11 to apply for judgment and sale for taxes of some 500,000 parcels of real estate involving over $100,000,000 of delinquent 1930 taxes–100,000 more items than were delinquent in 1929. On the same day Senator Lewis of Illinois appealed to the United States government for an immediate loan of $30,000,000 to keep the city of Chicago from collapsing financially, and to enable it to prevent the actual starvation of hundreds of thousands of its citizens and to pay a few back salaries of teachers and other civic employees. One would think that in this setting a sane and intelligent convention, imbued with even average common sense, would have cut out the brass bands, the parading, and the senseless speeches, and would really have got down to business and seriously worked out an economic program, or at least discussed some far-reaching policies to lead the country out of its economic distress. But no–the convention was interested only in the wet plank. As in the Republican convention the question of beer and booze outranked everything else. That was what the delegates wanted settled. They did not give a tinker’s damn about anything else. So far as they were concerned, they, like their leaders, were perfectly willing to ignore the economic chaos. The delegates would not have cared if the platform had made no reference whatever to the impoverishment of millions of our people. As it is, the platform made a great hit; it is short, concise, and without the usual number of weasel words, though it has quite enough. But beyond that there is little to be said for it. True, it calls for unemployment and old-age insurance, but that is not to be done by the Democratic Party next year, if it takes hold of the government, but is to be left to the tender mercies of forty-eight State legislatures. It believes in the spread of employment by shorter hours of labor and a shorter week, with the government setting the example, and it wants, of course, to help the farmer. But when it comes to the relation of government to business, we have the same old swindle–the same old Republican swindle. Thus it desires “the removal of government from all fields of private enterprise, except where necessary to develop public work and natural resources in the common interest.” And then in its next paragraph the platform pledges the government to regulate some more; it asks federal control of holding companies which sell securities in interstate commerce, and of the rates of utility companies operating across State lines. It wants the government to control and regulate “exchanges trading in securities and commodities”–as if it could tell us just where in the federal Constitution is to be found a power to regulate domestic concerns of this kind. For the rest, the platform would have been an admirable document in the campaign of 1908. To heighten the effect of this, the managers of the convention gave to ex-Senator James A. Reed of Missouri the opportunity to make what was undoubtedly his final appearance in public life and to ride again his favorite hobby that we must control the great corporations and trusts and prevent mergers and other unfair trade practices-nothing else is needed to restore America. It was a speech that would have read admirably in the days of the Northern Securities case. As a keynote to stir enthusiasm, to launch a Presidential campaign with high hopes and fervent loyalty, it had about as much effect upon the delegates and the spectators as has a pebble on Lake Michigan. Nowhere in this much-acclaimed document is there a single realization of the vital part that Europe has played and is playing in our economic life and in producing our economic distress. Incredibly enough, in view of the conference at Lausanne, the platform calls for insistence upon payment of the debts owed the United States by foreign nations, it opposes their cancelation. It favors also a monetary conference ”to consider the rehabilitation of silver and relative questions.” As for the deadly tariff it apparently denounced this in its preamble while carefully refraining from calling attention to the fact that the Democrats not only voted in large numbers for the Hawley-Smoot tariff but were responsible for the recent tariff increases in connection with the measures meant to produce additional revenue by other means. Then the platform went on to call for “a competitive tariff for revenue, with a fact-finding tariff commission free from executive interference,” and another international economic conference “designed to restore international trade and facilitate exchange,” with no explanation as to what constitutes a “competitive” tariff. Nothing here to bring hope to Europe; not a word about that sacred obligation of ours to enter the League of Nations, the child of that immortal Democratic President, the last Democratic President, Woodrow Wilson. Nothing whatever here to aid Lausanne or Geneva; nothing to give genuine hope to Europe of immediate, vital, and enlightened cooperation. Yet I do not deny that the platform is an effective one from the purely political point of view. It is short enough to be read, it shines by contrast with the Republican, and its wet plank alone, in my judgment, will carry the party to success next fall, unless its candidates blunder incredibly in the months to come. There will, of course, be some Wall Street men to declare that it is dangerous. It is really nothing of the kind even from their point of view, and the candidates, heaven knows, should not keep a single banker awake o’ nights from New York to San Francisco; they are as safe for capital and big business as Reed or Smoot. Never have I seen a Presidential ticket named at a national convention with so little enthusiasm. Franklin Roosevelt won in spite of the incessant blunders and unlimited stupidity of his managers out here–managers you would not employ to run a $10,000-a-year corporation–because, as at Kansas City in 1928, you cannot beat a candidate with a commanding lead if you cannot agree in advance upon one man to fight against him. The demonstration when Roosevelt was first named would not have lasted twelve minutes but for the horrible organ and the band. When he was nominated, the galleries were silent and only the delegates whooped it up for a few minutes, with the States that had voted for Smith sitting grimly in their seats. 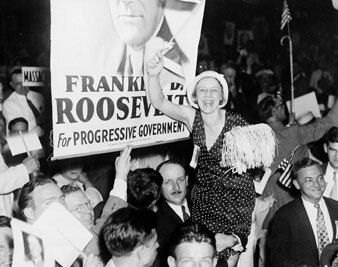 I know that the galleries were packed by the local politicians–many of them Catholics; that accounts in part for the enthusiasm for Al Smith, but by no means for all of it; there certainly was no enthusiasm whatever for Franklin Roosevelt, much less for the man picked by Hearst, McAdoo, and Roosevelt for Vice-President. I talked with many delegates and I know they accepted Roosevelt only as the least of the evils presented to them. There was a time in the third balloting when it looked as if one or two delegations might break from him, and the Roosevelt high command was badly frightened. But there was no fight, no coherence, and no leadership in the opposition. Garner fell easily for the bait of the Vice-Presidency. The galleries, by the way, yelled derisively when William G. McAdoo announced that California would go for Roosevelt, one section asking him in unison: “What price California?” The rumor is that McAdoo’s reward is to be the Secretaryship of State. For unblushing effrontery and hypocrisy that statement of McAdoo’s that he felt the candidate who had such a comfortable majority should be nominated goes beyond anything I have ever heard in thirty-five years of dealing with politicians. For this is the same William G. McAdoo who boasts that he got the nomination away from Champ Clark in Baltimore in 1912 under precisely the same circumstances, Champ Clark having a clear majority in the convention. Thus Franklin Roosevelt’s pursuit of the Democratic nomination has been successful and he has the right to take seriously the references to him as our next President. So has triumphed his campaign of evading all the pending issues, of refusing to answer questions as to how he stands on the problems of the day. As a matter of fact, if he is wise he will continue his policy of silence; it will be safer and he will probably be elected anyway. Roosevelt’s success is also the triumph of cowardice and muddle-headedness–of the inability to think any real problems through. His choice is proof positive that the convention was not thinking about our economic chaos and distress, that it was not bent on finding the best possible man to carry on the country in this hour of unparalleled economic difficulties. Two delegates got up and protested that their delegation had been committed to Roosevelt before any other candidates were in the field. Only two speakers from the platform had the courage to say that it was scandalous to be discussing booze when millions of Americans, utterly destitute, were begging for bread. The delegates may have heard this but it affected them no more than if somebody had said that the first trip to the moon would probably start in 1952. Of course if the nomination had been awarded on the grounds of great intellectual capacity, of proved boldness in grasping issues and problems, of courage and originality in finding solutions, the honor would never, never have gone to Franklin Roosevelt. I admit that it would have been hard to find anyone in the Democratic Party to measure up to the needs. On the other hand, I doubt if any other candidate ever carried off this prize in the face of such indifference and after such a blistering and brutally severe attack upon him as that by Heywood Broun on Roosevelt in the Scripps-Howard papers of June 29. The newspaper observers of this spectacle, at least the thoughtful ones, were profoundly saddened by what they saw, despite all their cynicism. More than one came to me to say that this was beyond endurance. They agree with me that the Democrats could hardly have done much worse for the country unless they had put Garner up for first place. For myself I found myself more and more wondering what the next convention would be like, and whether there would be any convention at all. I am willing to bet that unless there is a marvelous improvement in our situation, the next quadrennial conventions, wherever they meet, will be neither so remote nor so detached from what is going on; that they will be facing the issues of the day because those issues will not let them do anything else-provided, of course, that by that time we have not a fascist dictator in the White House. A coalition Cabinet is on the boards now. Would these delegates care very much if the heart were cut out of our democratic institutions? I doubt it, provided that the act was carefully draped with the American flag, and it was explained to them that George Washington was a good deal of a dictator in his time–like Lincoln and Wilson in wartime–and that, after all, this is a war to save the Union in which we are now engaged. Now engaged? For all that a foreign observer might really have learned of our estate from this convention, we are sailing upon the most peaceful, the quietest, and the least rippled of seas.